Poll Question: Would you be interested in purchasing any of the following items. 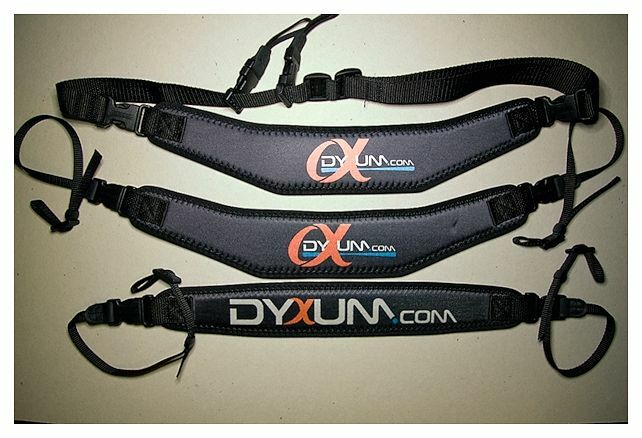 Following on from a poll that was posted back in June 2011, the Dyxum team has been investigating the possibilities of procuring branded camera straps and shirts. We have had prototypes made and have also trialled some distribution methods. We hope to be able to make some straps available in the near future, but we are currently working out what costs are involved in shipping, insurance and local taxes. The straps are produced by Op-Tech in the US and we would expect prices for these Dyxum branded straps to be competitive with retail prices for Op-Tech straps as we are simply looking to cover costs/risks incurred. We have found that distribution of shirts across borders is a logistical problem, so we might be further away from being able to offer those; we would however be interested to hear from any Dyxum members who might be willing to take on local ordering and distribution in their own country – if there is anyone out there who is involved in the production of custom shirts, so much the better! If you think you can help, please just post in here, or PM one of the site Admins. In the meantime, we want to check that interest in shirts and straps has not waned since the original poll, so we would like to invite you to indicate which (if any) of the listed promotional items you might be interested in, should they be available - remembering that none are available at the present time. We have allowed for two levels of enthusiasm for each item (three if you count the last two options). You should find you are able to ‘vote’ for more than one item if you wish - ie once you have voted for one item it will allow you to vote for another. Pretty sweet. I don't shoot with a strap but if I did I'd buy one. I'm amending my post, having seen that the utility strap is indeed a sling. That was not immediately clear to me from the description. I only have a home made sling combo made from a77 strap and an adapted non camera bag strap. An upgrade would look a little less Heath Robinson. I also prefer the alpha logo also showing with the dyxum logo. I'm proud to shoot alpha AND be a Dyxum member. What about Dyxum branded replacement lens caps? Op-tech do the 'Utility' as a normal or as a sling (the top one in the photo above is a sling) - the fittings are interchangeable. I love the straps, and I might buy one or two depending on the cost. I'm not much of a branded polo kind of guy, but if there were a graphic tee themed on photography and including Dyxum, I'd be all for it. Maybe a lens breakout diagram or something else that would look cool. I know I'm on the relatively young side for Dyxum members so I guess that makes me a bit of a niche market on shirts. Cool stuff though, I like it! Gear: Various Alpha mount and Olympus Digital and Film cameras. Lens and other goodies collections grow daily. Photo/Design student and burgeoning freelancer. I also make Hip-hop music. The straps are very comfortable and well built as per OpTech standards. They are a neoprene material with a non-slip surface on the inner side of them and the material used has a little bit of give, or stretch to it to act as a shock absorber for heavier rigs. I like the OpTech classic strap, but... I'd like the Pro loop strap even more. I've used both and IMVHO I much prefer the pro strap. I would like to purchase several of the polo shirts, several of the utility straps and several of the patches mentioned by rickztahone, above. NOTE: I voted in the ballot at the beginning of this thread.